Tree view: the navigation on the left hand side of the help site allows you to find all available content organized by topic and sub-topic. The first level of organization is by the role of the user in the system (e.g. 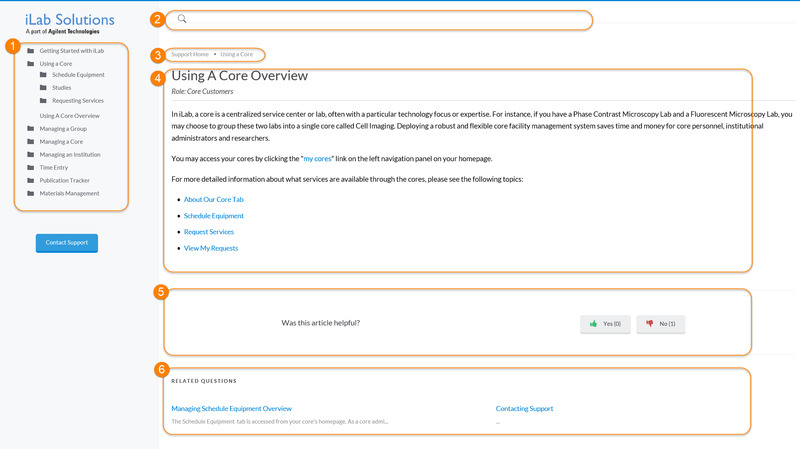 "Using a Core" for Core Customers, Managing a Group for PIs / Group Managers, etc.). The next levels are organized roughly by the various interfaces in iLab. In some cases, a single article will cover all details of an interface, but for more complex interfaces there will be a folder with various more sub-articles. Article: the content of the help site. Most articles have a table of contents near the top, which allows for easy jumping to any section within. Was this article helpful? : Please feel free to candidly share you feedback if an article was helpful to you. This feedback will be used to improve iLab's help content over time. Related questions: Articles related to the current article are listed here for easy follow-up browsing.